It is one of the startling surprises in a translator's life to discover that the labour of translation-his creative transformation of a work, so that it may be read and received in another language-does not necessarily become easier as his experience increases and his so-called expertise grows. On the contrary, words and phrases may become more of a problem for him, more difficult to render satisfactorily, as he learns more about the intricacies and nuances of a foreign tongue and encounters more vividly and viscerally the complexities involved in 'interpreting' these expressions for a new audience in the transnational republic of letters. Experience and reflection are certainly not the natural enemies of accuracy and clarity, but they create a new level of exigency that is unsettling, even as they offer new opportunities for extension, elaboration, and refinement that are welcomed as an invitation and a challenge. The title of Jean-Marc Coicaud's book, Légitimité et politique. 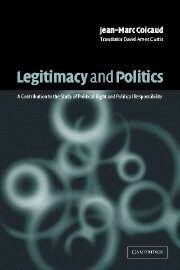 Contribution à l'étude du droit et de la responsabilité politiques, is rather straightforward in French; I have translated it as Legitimacy and Politics: A Contribution to the Study of Political Right and Political Responsibility. And its basic themes and insights, if they may be summarized quickly and in unsystematic fashion-namely, that legitimacy must be related to politics, that legitimacy is not mere conformity to law, and that all these terms (legitimacy, politics, law) as well as the notions they imply and implement (consent, norms, the identity of a society, etc.) are not wholly separable from their historical instantiations-are presented by the author with considerable rigour and precision. Yet as a translator, questions were raised in my mind as soon as I was confronted with the task of translating this title and of coming to terms with its key words and concepts. An account of these questions and my responses to them may be of value to the reader as she embarks upon, or seeks to reflect back upon, the present translated work. A brief incident from my own life may serve here as an introduction. A little more than two decades ago at Harvard University, the same institution Coicaud attended while writing his book, I took a course in political philosophy from Professor John Rawls, author of the celebrated volume A Theory of Justice. To my disappointment 'political philosophy' turned out to mean not much more than 'moral theory', so that any political manifestations and issues could be viewed only upon a very distant, almost invisible or unrelated horizon. Curiously, Marxism was discussed and dismissed in one lecture, Rawls treating it as minor variation in the way one writes utility functions. Neither it, nor the constant challenge anarchism poses to the predominant tendency of 'political philosophy' to seek theoretical justifications for present or alternative political arrangements, were given serious consideration. Nor were the similarities between Marxism and anarchism, on the one hand, and liberalism, on the other, ever highlighted or investigated, even though it was beginning to dawn on me that the former two doctrines evince as much of a reticence to deal forthrightly with political questions and power considerations as the latter one does. As was already my habit by then, I engaged in a self-invented 'education through opposition': after having discerned the biases and preferences of the instructor, I proceeded to write a paper (in this case, one later reworked for publication) (1) that sought systematically and savagely to contest his views. (2) Specifically, here I attempted 'a class and state analysis' of the utilitarianism of Rawls's favourite moral theorist, Henry Sidgwick, author of The Methods of Ethics; and I endeavoured to show that utilitarianism must be understood in historical perspective, starting from the interpretation thereof offered in The German Ideology. Instead of viewing the growing formalisation present in this late nineteenth-century Englishman's writings as a triumph of theoretical distillation and purification-the view of Rawls, who regarded the reduction of moral precepts to a discreet and decreasing number of axiom-like propositions to be a mark of progress (and not, for instance, a process of desiccation or degeneration leading to ultimate historical irrelevancy and demise)-or as merely a reflection of changing class interests-a mechanical extrapolation of Marx and Engels's not wholly unenlightening historical overview of the utilitarianism of the elder Mill, Jeremy Bentham, and their predecessors in English political economy (3)-I argued that such formalisation must be analysed, in a non-reductionistic way; it would be seen, rather, as a creative, independent articulation of the growing rationalisation and impersonalisation characteristic of the bureaucratic mind-set in capitalist society during a period in which, after the political triumph of the bourgeoisie (1832 Reform Bill) and in the context of working-class demands for an extension of the suffrage in England as well as for other rights that create a strain upon hierarchical governance, an impersonal state apparatus comes into existence, silently seizes power, and undertakes to impose social harmony and tranquillity from the outside upon all classes and segments of the population-enfranchised, unenfranchised, or about to be enfranchised-by employing the difficult-to-contest language of an 'impersonal decider'. Needless to say, such an interpretation challenged both liberal and Marxist modes of explanation and interpretation as well as their efforts at justification or counterjustification. Now, liberal thought prides itself, certainly, upon its willingness to entertain a plurality of viewpoints. In the response of Rawls, perhaps the pre-eminent liberal theorist at the time, I discovered with a certain perverse inward satisfaction the limits to such professions of openness and pluralism. He refused to grade the paper and instead scrawled a page of comments . . . to explain why he would not comment upon it. Initially mystified and yet also intrigued, I requested a meeting at his office. We spoke, cordially, for about a half an hour, at the end of which time he asked me, point-blank, 'What are you: a sociologist, a historian, or what? ', each term, perfectly articulated, falling from his lips with a distinct expression of disdain-as if the very idea of introducing social considerations or just historical context into philosophical thinking about the political world had only now occurred to him for the first time and was immediately experienced with utter revulsion. My explanation that I was a student in his very own philosophy department and not some alien discipline's import only increased our mutual sense of bafflement, and the interview quickly ended. When I pointed out to his teaching assistant a few days later, with mock innocence and shock, that I had still not received a grade for the paper, she told me that it was 'too different' (so much for liberal tolerance . . .) and that she and Rawls had decided that it 'would not receive any grade at all: A, B, C, D, or F', adding that I would receive a B of some sort for the course, as if that were what should be of paramount concern and might somehow placate me. She quickly fled, running off to watch a Red Sox-Yankees game-a response that greatly upset me at the time, but which I, now older, less serious about myself, and more serious about baseball, can fully appreciate in retrospect. "Rawls has been led, in his later writings, to attune his rhetoric to what constitutes, in A Theory of Justice, his practice, but without him then wanting to admit it. His revisions are not lacking in breadth. He gives up on the universal import of his categories of analysis. He recognises that the ends of political philosophy depend upon the society to which this philosophy addresses itself. And he comes to affirm that his objective is to construct a theory of justice that is the most reasonable for us. Fittingly, he acknowledges that his understanding of justice corresponds to the conception of the individual belonging to liberal-democratic culture, and that it concerns that culture alone. Rawls almost goes so far as to set the United States and its basic values as the limit for his reflections." It is more than doubtful that my minor, intemperate undergraduate challenge to Rawls's abstract moral liberalism might have had any effect upon his subsequent decision to adjust his language in a more historically informed political direction, and I certainly would not want to claim any credit for the resulting changes in his point of view. Still, it is refreshing to see now in Coicaud's work an explicit will to relate questions of justice to political and historical considerations that are deemed inseparable from those questions while also refusing to accept liberal precepts unquestioningly in their actual historical incarnations (as Rawls, Coicaud reports, now seems to be doing). In consultation with Coicaud, I have not eliminated this polysemy but resolved it in a provisional way by generally favouring politics. Despite the fact that he discusses Schmitt's The Concept of the Political, Coicaud himself does not make any hard-and-fast distinctions between le politique and la politique, nor does he offer a definition of either term or even take a position on the historicality or the essential (that is, here, non-historical) character of the one or the other in relation to society and its institution. Coicaud freely acknowledged to me that he has not yet reflected upon these terms sufficiently to take a stand of his own. An honest admission-and a prudent stand, as well, considering the distinguished writers who still disagree among themselves on this topic. Given that these two similar nouns (the term 'homonym' is not quite applicable here, since it is their respective genders that create the difference) are not employed in any systematic or technical way, I have upon occasion, with the author's approval, even changed (what would be) 'the political' to 'politics', as it renders the result more familiar to an English-speaking audience without in any way violating the author's deep-seated intentions. Yet, it is in quite general terms that Coicaud defines the elements that go to make up legitimacy. Legitimacy, he asserts, assumes an 'unequal distribution of power', an 'asymmetric relationship constituted by the command relations between the governors and the governed', as well as 'political differentiation', for a 'division that separates those individuals who command from those who obey is that upon which the logic of legitimacy rests'. Moreover, 'in order to understand how a theory of legitimacy is based upon the separation of the governors and the governed, one must', he states, 'first distinguish it from those political concepts that find it impossible to justify the power of the State'-which seems to imply that legitimacy, by way of contrast, necessarily involves a justification of the State's power (this creates an additional potential for anachronism, even though he emphasises that the State is not to be taken as equivalent to the 'bourgeois State'). The general theory of legitimacy also introduces the notions of consent and laws, as well as that of the norms-or 'values', to employ the neo-Kantian axiological and post-Nietzschean language Coicaud usually prefers-by which the identity of a given society serves to posit and then to judge the effectiveness and appropriateness of its actual laws. Thus, as stated previously, legitimacy is not understood by him as mere conformity to the existing law. Nor is Coicaud adopting a conservative or reactionary authoritarian viewpoint regarding either political arrangements or their legitimation via discourse. Here, Coicaud quotes Michael Walzer, who states that, 'in the context of consent theory, we do not say that the government is just, therefore the citizens are obligated, but rather that citizens have committed themselves, therefore the government is just'-a crucial point, but one which would pack a bunch of historical elements into a general theory of legitimacy. For, Coicaud decidedly wants to apply legitimacy theory's study of consent not only to regimes that include 'citizens' but to all societies whose governments do not rely solely upon force (and no governmental apparatus can perpetually rely solely upon force). He goes so far in one place as to derive 'the question of justice in human life' from a sweeping analysis of the demands and dynamic development of the newborn child. There is still considerable force as well as some substantial benefit to Coicaud's approach, even though the general and historical expositions of legitimacy sometimes seem at odds or enjoy an uneasy coexistence. Viewed in relation to politics/the political, the 'problematic of legitimacy' (to use his terminology) prevents him from turning his historically informed approach into a hermeneutic-i. e., merely interpretational-undertaking: a political judgement of legitimacy is such that it cannot simply retrace what the laws have decreed in order to come up with an answer to the question of where justice lies. Moreover, his insistence upon always examining a potential for legitimate command-obedience relationships in their historical context strongly militates against the tendency to 'adopt an anachronistic point of view, wishing to evaluate the past on the basis of criteria for judgement borrowed entirely from the present'-the sort of confused retrospective moralism characteristic, for example, of much 'left-wing' political correctness in academia today, which is a flip side of the tendency of traditionalists to judge the present solely on the basis of what they (presently) consider to be values consecrated by the past. "the rise of the concept of legitimacy as a political problem [and it is as a 'political problem' that we are discussing it here-D. A. C.] was prompted by the collapse of direct rule in the ancient world [my emphasis-D. A. C.]. It owes much to the substitution of imperial authority for the direct democracy of the agora [a particularly nonsensical, counterhistorical expression-D. A. C.] or the personal rule of local tyrants. Thus the medieval application of 'legitimate' to persons in office reflects the long acquaintance with the power of deputies of the emperors or popes." The author whom Coicaud cites, and to whom he refers us in order to consider 'the history of the term legitimacy', seems to be telling us that it is the death of the polis as a self-governing, collectively autonomous political entity that serves as the historical context for the rise of political legitimacy theory, articulated as the possibility of a critical evaluation of separate authority that also involves or implies a (grudging or enthusiastic) acceptance thereof. This would tend to confirm Coicaud's general definition of legitimacy in terms of political differentiation, an unequal and asymmetrical distribution of power, as well as consent, by the governed, of the actions of a separate state apparatus run by governors-notions contested in the Greek political imaginary-just as it would be consonant with the historical struggle of early Renaissance cities to carve out a realm of political rule for themselves at the expense of, but also in the context of nearly inevitable compromises with, aristocratic, monarchical, imperial, and papal authorities. Yet this set of political-linguistic circumstances might now serve to circumscribe legitimacy historically, excising therefrom the very period in which the polis, and thus politics and perhaps also 'the political', came into existence as distinct social-historical forms. "the first definition of governmental legitimacy as derived from consent grounded on natural law is due to William of Occam (first half of fourteenth century), the thinker whose nominalism so revolutionized medieval philosophy. The basis of Occam's reasoning was the older medieval argument quod omnes tanget-what touches all must be approved by all." You are not suppliants at my own hearth. It is thus doubtful, at least according to some observers and for varied reasons, whether legitimacy as an analytical concept can apply to the political imaginary of ancient Greece-but also doubtful, in light of the foregoing, whether one can think legitimacy theory historically without reference to the contributions made by the ancient Greek poleis, without reference to the poleis's demise as well, and, finally, without reference to the rise of early modern cities within a nearly overwhelming set of hostile circumstances. It is unfortunate, in this respect, that Coicaud does not take into account political and associational practices that date at least from the 1871 Paris Commune and have their roots further back in a variety of modern efforts at individual and collective autonomy-e.g., the English, American, and French Revolutions, as well as the workers' movement (and, more recently, the student, women's, and ecology movements)-and that have been extended on the practical plane as well as theorised throughout the twentieth century (Council Communists, Spanish anarchists and POUM-ists, Hungarian workers' council revolutionaries, or the students of the May 1968 movement in Coicaud's native France, to take a few striking examples). Along with his assessments of what I consider the dogmatic buffooneries of authors like Louis Althusser and Pierre Bourdieu-who, in a highly conservative move, attempt to salvage classical Marxism by adding thereto a few 'scientific' updates-as well as of the invariably immobile views of doctrinaire anarchists, it would have been interesting for Coicaud to have examined thinkers and movements that, over the course of the century just ending, have challenged anti-political tendencies and biases in classical liberalism, Marxism, and anarchism. How would a former Marxist committed to a direct economic and political democracy and inspired by classical Greece, like Castoriadis (whom Coicaud cites in his bibliography but not in his text or in his notes), or an ecologist quite critical of many strains of anarchism and favourable to a municipal libertarianism also inspired by ancient Greek democratic practices, like Murray Bookchin, fare when the question of legitimacy is raised? How might an engagement with their thought have led to a more complex and nuanced appreciation of legitimacy in its historical context, a finer understanding of the origin, applicability, advantages, and perhaps also limits of legitimacy theory? We can nevertheless benefit from Coicaud's reflections-which are intended as a defence and advancement of the concept of legitimacy-as a basis for our pursuing such questions further, a process the author would certainly not consider unwelcome, and which he would be sure to explore with the same penetrating incisiveness that, in his book, he has shown himself capable of illustrating and exemplifying. Let us now return to the title-or, more precisely, the subtitle-of Legitimacy and Politics in order to allow a reflection upon the translation process to shed further light upon this book. The volume is intended as 'a contribution to the study of political right and political responsibility'. Like Rawls's A Theory of Justice, with its indefinite article most prominent in its title, this subtitled 'contribution' is modest and intentionally undogmatic in its ambitions. Indeed, Coicaud champions the values of tolerance and pluralism, as do Rawls as well as Weber, though he believes that one can no longer do so in the same ways as they have done, given their inadequate conceptions of legitimacy and the contradictions into which their respective brands of tolerance and pluralism have led them. The word that captures the translator's attention, however, the one that proved to be the most difficult term in the entire translation, is the word droit, which means 'right' but also 'law'. We can begin to get an idea of the difficulties this word poses when we focus on its usage in the subtitle. What is droit politique-which, when framed in terms of legitimacy, Coicaud calls the right to govern? The translation 'political law' would sound strange to many an English speaker and might conjure up, for some, disturbing images of a politicised law wherein it is men and not laws that govern. 'Political right' is not a phrase with which English speakers are very familiar, either. But, as Coicaud himself pointed out to me, droit politique is found in the subtitle of Jean-Jacques Rousseau's famous treatise, the standard translation of which is On the Social Contract, or Principles of Political Right. 'Political right' for Coicaud would involve not just the specific laws enacted to regulate the political process, nor simply the extant political rights recognised in a community, but would concern, too, the norms that stand behind and govern (in the broad sense of define, guide, and control) the concrete rules a society adopts in order to conceive, implement, oversee, monitor, and guarantee the political life of a community. The Marxist response to political right-and to the laws and rights that embody it-is, of course, thoroughly negative. Coicaud quotes Marx and Engels that, 'as far as law is concerned, we with many others have stressed the opposition of communism to law, both political and private, as also in its most general form as the rights of man'. Herein we see the translation overlap of these two English terms-which in German, as in French, are both expressed by a single word: Recht. (Hegel's treatise on legal philosophy, for example, is sometimes translated as The Philosophy of Right and sometimes as The Philosophy of Law.) Choice thus becomes necessary, and it is not always easy. I have had to decide between 'right' and 'law' on nearly every page of Coicaud's book, a situation sometimes further complicated by the presence of a second French word meaning 'law': loi, which has both general and specific connotations, just as droit does. Short of indicating the French original each and every time within brackets or of employing some other such artificial and encumbering device that would again detract from the flow of the printed translation, (18) I have, after careful consideration and, I hope, judiciously, opted for one or the other, often doing so in consultation with the author-who, fully appreciative of the difficulties the translation of droit poses in English, patiently communicated to me his hesitations, his decisions, and sometimes his reconsiderations. The rendering into English of another phrase involving right/law, l'État de droit, is also worth mentioning, for it too involves this vexing interface of the French, German, and English legal and linguistic traditions. Challenges of this sort make of translation an imperfect, and often maddening, but always passionately interesting transnational art-an encounter, indeed, with social imaginary significations that go well beyond the horizon of any individual author's (or translator's) intention or understanding-instead of a ready-made and easily applicable science, ripe for computerisation. In English, one tends to speak of 'the rule of law'. This has become a particularly empty and useless phrase, as its usage ad nauseam by all sides has driven home to me once again as I write these very lines (the Elian Gonzalez custody case in America). Taken by itself, the 'rule of law' decidedly does not fit the 'problematic of legitimacy' laid out by Coicaud, for it is hardly distinguishable from the 'conformity to the law' rhetoric that, in his correct view, falls short of the standard for legitimacy. One can avoid this now nearly barren expression by using l'État de droit's somewhat more familiar German equivalent: Rechtstaat. This solution sidesteps the issue, however, by simply displacing the problem into a third language. Yet it also has one minor advantage: it is better as a translation than 'rule of law', for it is consonant with Coicaud's association of legitimacy with the establishment of recognition for the justification of a State. But an ambiguity also intervenes between the French and German. At times, Coicaud himself takes a break from state justification to speak of positive contributions to 'the life of the city'-cité, in French. Unlike État, Staat is used-in the phrase autonomer Stadtstaat-to talk about the polis. And yet, just like the English-language expression city-state, its German counterpart autonomer Stadtstaat actually is nothing more than an abusive mistranslation of polis, for it is of doubtful value to consider the latter to be a state formation, a separate governmental apparatus. These English and German phrases are particularly egregious anachronisms, their usages as erroneous as they are widespread. I have therefore settled upon 'rights-based State' as the most appropriate translation for Coicaud's understanding of l'État de droit ('constitutional State', the standard translation of Rechtstaat, packs too much historical specificity to be appropriate here). But at times I have called upon 'the rule of law' and Rechtstaat to supplement (double or triple) this term or to indicate specific technical or historical features of its meaning. The reader is thus forewarned by this specific discussion of droit-as she will also be alerted by Coicaud's general theme of legitimacy as being something more than and different from mere conformity to the law-that it must always be kept in mind that my imperfect but forced choices of either right or law may very well result in ambiguities and misperceptions at any particular location in the text. It will be in reading through and beyond these difficulties in translation that the reader will perhaps gain a greater understanding of the political and philosophical stakes involved and thus be able to reflect further upon this transnational linguistic conundrum for herself. One last feature of my labour as a translator should be highlighted in order for the reader to comprehend this volume in the most well informed manner possible. In contrast to most of the texts I have worked on during my fifteen years as a professional translator, I did not myself propose this one to a publisher. Instead, Cambridge University Press offered me a translator's contract after my name was recommended to Coicaud by the French Publishers' Agency in New York. Both my editor at the Press, John Haslam, and the Agency are to be thanked for their interest and support. 1. David Ames Curtis, 'A Class and State Analysis of Henry Sidgwick's Utilitarianism', Philosophy and Social Criticism 11:3 (Summer 1986), 259-96. Errata in 12:4, 387-88. 2. That same school year I wrote a paper for Robert Nozick's course on 'metaphilosophy', challenging its major premises, too. To my great disappointment, Nozick rushed up to me after I had completed my year-end blue-book exam to tell me that he had given me an 'A' of some sort on my paper-something, he pointedly told me, that he rarely grants. Not glimpsing in him the slightest sense that he was being challenged and ridiculed by my essay, I was overcome with a sense of failure. 3. I had already, in the Sidgwick paper, added a corollary to Marx/Engel's interpretation of utilitarianism by contrasting the radical egalitarian implications of Bentham's hedonistic calculus, articulated at the time of a rising bourgeoisie, with the 'poetry versus pushpin' moral hierarchy of pleasures espoused by J. S. Mill in the aftermath of the bourgeoisie's successful passage of the 1832 Reform Bill (elimination of 'rotten boroughs' held by the aristocracy and large land-owning gentry, partial extension of the suffrage to middle-class citizens, prospect of a wider suffrage and of broader political changes starting to threaten in the rising workers' movement). See John Stuart Mill, 'Bentham', in Utilitarianism, On Liberty, Essay on Bentham, Together with selected writings of Jeremy Bentham and John Austin (London: Collier, 1979), p. 125, and 'Utilitarianism', p. 259. 4. I had previously discussed these terms in my Translator's Foreword to Claude Lefort's Writing: The Political Test (Durham, N.C.: Duke University Press, 2000), p. xii, referring more expansively there to: 'the curious masculine noun of recent vintage, le politique-"the political" or "the political sphere", as is sometimes said now in English-which contrasts in French with the more straightforward, concrete, and familiar feminine noun la politique-"politics" or "policy", depending upon the context-and which derives from das politische, a neuter German word popularized by the Nazi-era German constitutional scholar and political thinker Carl Schmitt and then by his American emigrant former student Leo Strauss. . . . "The political" has been associated, too, with the writings of Hannah Arendt (wrongly, according to one young political scientist, who claims that "this term, developed by the right-wing jurist Carl Schmitt, has been ascribed to her by Marxist thinkers more influenced by Schmitt than she is") . . . and le politique is employed today by a wide variety of other French-speaking writers besides Lefort, including the late emigrant Greek political and social thinker Cornelius Castoriadis, whose usage of the le/la politique distinction differs markedly from his, and leading French classicist Jean-Pierre Vernant, who, in insisting that "the political", like "politics", has a datable birth and origin in the poleis of Ancient Greece, differs from both Castoriadis and Lefort on this score. Yet, "the political", as substantive noun, still reads rather inelegantly on the cover of an English-language book-even if we note the existence of Reinterpreting the Political, a recently published American anthology of "Continental" political theory that borrows its title directly from a passage in Lefort's influential 1985 essay, "The Question of Democracy"'. 7. One could also phrase the question in terms of whether the polis and politics/the political are translatable into prior languages, societies, and cultures-or whether, instead, such a translation effort is futile because anachronistic, it being an unjustified reverse extrapolation of a social-historical form that had not yet been created as a distinctive realm. 8. On 'the nostalgia for the origin', see my Fabio Ciaramelli translation 'The Self-Presupposition of the Origin', Thesis Eleven 49 (May 1997), 45-67. 9. M. I. Finley, Democracy Ancient and Modern (New Brunswick, N.J.: Rutgers University Press, 1973), pp. 26-27, 118. Finley's translation of graphe paranomon is: 'illegal proposal'. Clearly, a translation problem of colossal proportions arises here, and whatever solution one offers will depend upon one's view of the relevancy and applicability of legitimacy theory to the ancient poleis. In 'Max Weber and the Greek City-State' (in Ancient History: Evidence and Models [New York: Viking, 1986], pp. 88-103; see p. 99), Finley explains that 'Greek law has been notoriously a stepchild in modern study. Weber was no exception to the universal neglect of the subject'. 11. Cornelius Castoriadis, 'The Greek and the Modern Political Imaginary', in World in Fragments, trans. and ed. David Ames Curtis (Stanford: Stanford University Press, 1997), p. 93. 12. Aeschylus, The Suppliant Women, in The Complete Greek Tragedies, ed. David Greene and Richmond Lattimore, 2nd edn (University of Chicago Press, 1991), Aeschylus, vol. 2, p. 19. It is in this play (lines 603-604) that for the first time a juxtaposition of the two words that go to make up democracy-demos (people) and kratos (power)-can be documented (see Pierre Vidal-Naquet, 'The Tradition of Greek Democracy', Thesis Eleven 60 [February 2000], 78, and Pierre Lévêque and Pierre Vidal-Naquet, Cleisthenes, the Athenian: An Essay on the Representation of Space and of Time in Greek Political Thought from the End of the Sixth Century to the Death of Plato, with a new discussion On the Invention of Democracy by Pierre Lévêque, Pierre Vidal-Naquet, and Cornelius Castoriadis [Atlantic Highlands, N.J.: Humanities Press, 1996], p. 19; on p. 150, n. 11, Lévêque and Vidal-Naquet cite Ehrenberg as the source for this observation). In light of Coicaud's concern with the theme of 'exclusion', it is worthwhile mentioning, as well, that this play concerns the acceptance and integration of aliens (the daughters of Danaus) who have only the slenderest of claims to a common heritage with the city of Argos and the Argive king. 13. Cornelius Castoriadis, 'The Greek and the Modern Political Imaginary, World in Fragments, p. 86. 14. Pierre Clastres, Society Against the State: The Leader as Servant and the Humane Uses of Power Among the Indians of the Americas, trans. Robert Hurley (New York: Urizen Books, 1977). 15. See my recent translation of Claude Lefort's 'Dialogue with Pierre Clastres', in Writing: The Political Test, pp. 207-35. Those who saw Richard Harris in A Man Called Horse have a vivid picture of what 'the "torture" . . . involved in rituals of initiation' may entail in Indian societies. Clastres treats such 'torture' as an integral and necessary part of what he considers their anti-statist social institution. 16. Coicaud's distinctive response, in relation to a Weberian 'norm-legitimacy', is to refuse to reduce legitimacy to a belief in legitimacy; he does so by challenging the so-called separation of facts and values championed by Max Weber. 17. Rousseau, Merquior noted, is the archetypical exponent of 'power-legitimacy'. Coicaud's integration of power considerations into his 'norm-legitimacy' approach, which takes values seriously and does not reduce legitimacy to mere belief, moves him from Weberian 'norm-legitimacy' to a position that does not wholly repudiate the outlook of 'power-legitimacy', so long as 'values' are recognised and given their due. For Coicaud, Weberian 'norm-legitimacy' does not really secure legitimacy at all, given Weber's inadequate notion of objectivity, his neutralist stance on neutrality, his consequent debilitating refusal to take a stand in relation to values, and his faulty view of the benefits and scope of legal positivism. Coicaud avails himself of a keen observation from Raymond Aron to illustrate a further indication of Weber's inability to come to terms with legitimacy as a political judgement, based upon values, that is not reducible to de facto belief. There is a discrepancy between the four Weberian types of action (goal-related rational action, value-rational action, affective behaviour, and traditional action) and the three Weberian types of political legitimacy (rational, traditional, and charismatic). 'It is easy to notice', Coicaud comments, 'that the failure of these two typologies to coincide with each other is due to the absence of a power relationship that would be the equivalent of value-rational action.' A practical consequence of this discordance may be seen on the level of civilisational analysis, and it relates directly to the question of the status of the polis in relation to the study of legitimacy. In 'Max Weber and the Greek City-State' (Ancient History: Evidence and Models, pp. 93-9, 103), M. I. Finley criticises Weber's contortions and the lengths Weber had to go in order to force the Athenian democratic polis into the 'charismatic' model. In these matters, historical falsification is not the province of Marxism alone; it extends to Weber's neo-Kantianism, where the 'separation of facts from values' prolongs into social theory the incoherent instituted split between Kantian pandeterminism (in the first Critique, Kant states that 'everything which exists is completely determined') and Kantian moral theory (its unattainable polar star). As we noted above, Coicaud also points out the connection between Weber's inadequate notion of objectivity and his neutralist view of neutrality, on the one hand, and his debilitating refusal to take a stand in relation to values, on the other. Building upon this insight, we might go further and, challenging Weber's neo-Kantianism, say that there is a revealing homology between his notion of ideal types, which he treats as a 'utopia', both useful and unrealizable, and his assertion, in a 1908 letter to Robert Michels that 'any thought . . . of removing the rule of men over men through even the most sophisticated forms of "democracy", is "utopian"'. Coicaud quotes, but does not challenge, this last statement-which is, indeed, consonant with his own view that legitimacy entails an 'asymmetry' in the 'political differentiation' of governors and governed, instead of a possible reversibility of the roles of governor and governed (Aristotle's definition of a citizen as someone capable, by turns, of ruling and being ruled). 18. One can imagine a not-too-distant future where, with the advent of the 'e-book' or another such electronic device that presents text and other information in a hyperlinked format, it will be possible to place the original language for key words and phrases 'underneath' the translated text and thereby enable the reader to call up the original at will for examination, consideration, and reflection. Of course, such an artifice, while perhaps highly informative to the reader, by itself does nothing to resolve any concrete problems of translation. 19. In addition to reviewing the translation, Coicaud has also made a number of alterations in the text, nuancing some points, suppressing others outright, and clarifying eventual ambiguities. The present text therefore is, in this respect, more than and different from a faithful translation.